Dan Rather, anchor and managing editor of the CBS Evening News © David Burnett/Contact Press Images. 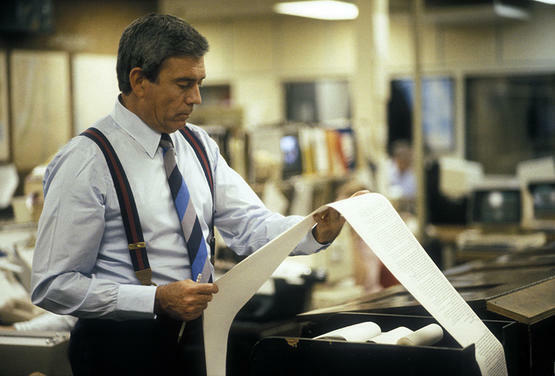 In 1981 Dan Rather became not only the anchorman but also, like his predecessor Walter Cronkite, the managing editor of the CBS Evening News. As television news evolved, so did the position of the anchor, who was never just a well-spoken person with a great voice who was good at reading a teleprompter. Former CBS Evenings News producers David Buksbaum, Tom Bettag, and Jim Murphy all recall how the anchors play an important part in the makeup of the evening news. They read copy and write and rewrite scripts and are instrumental in deciding the lineup of the stories and the editorial work of trying to decide what the most important stories of the day are. The anchor has a veto on the stories featured on the evening news, but she/he is often “in tune” with the producers. Rather recalled, for example, how he and his team decided to walk away from the Bobbitt case in 1993, or from the the Chandra Levy case in 2000. While the "face" of the network, the anchor is part of a complex and fine-tuned team of producers, writers, cameramen, and correspondents. As producer Steve Glauber remembers, the CBS Evening News was staffed by excellent producers such as Lane Venardos and Tom Bettag, Andrew Heyward, and Jim Murphy, so Dan Rather could often “let the ship run” and balance his numerous obligations, as the consummate multitasker he was. Writer Eric Wybenga recalls how working at CBS News for Dan Rather was "a series of being shot out of a cannon and then onto the next thing," and how Rather was able to keep stay in control amid chaos. The anchor and managing editor of a broadcast news is thus a complex task that required experience and a broad set of skills. Producer Tom Bettag explained how anchors are “experienced journalists who have deep life experiences,” from Cronkite, who covered World War II and was an United Press correspondent, to Dan Rather, who had reported from Vietnam and worked on the Watergate scandal. Advertisements for the CBS Evening News emphasized the anchor's background and experience. For producer Jim Murphy, television talent are “three-legged animals” who need to have communication skills (the performance part of the anchor job); journalistic skills, which is their credibility; and “this intangible of like personality or something that they represent to people." Dan Rather himself always emphasized that he was a reporter-anchor and not the other way around. This explains why he often pursued a story on the ground, often abroad, giving more legitimacy to his reports on the evening news. Video - "Making of CBS News"